Although the baby of the fleet, Blue Planet 1 is fast, spacious and beautifully fitted out. 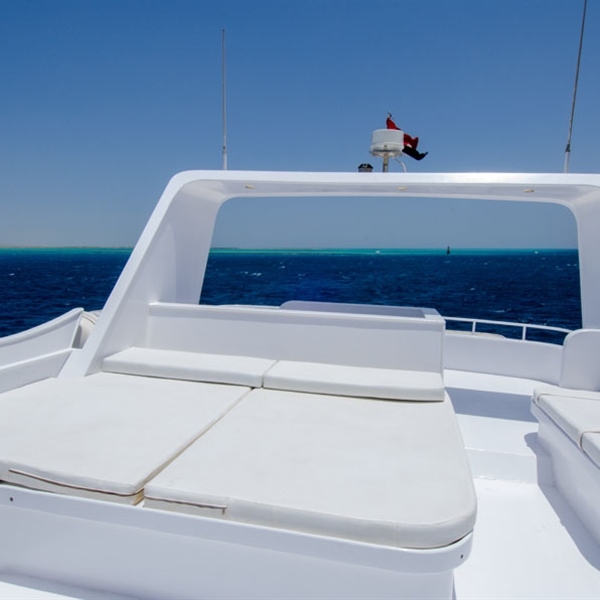 She is a friendly boat and ideal for smaller groups who would like to explore the Northern Red Sea from Hurghada. Built in 1999 and fully refitted and upgraded in July 2013, the 27 metre Blue Planet 1 offers you the opportunity to dive the famous itinerary of the "North & Wrecks" as either a 3 night mini safari combined with resort or, for groups, a 7 night itinerary, departing from Hurghada. 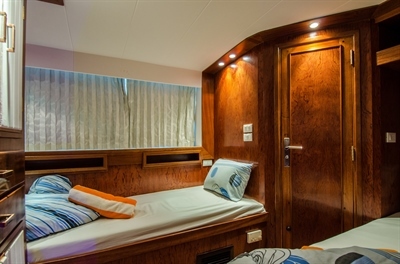 Blue Planet 1 offers 8 twin bedded cabins, all with en suite bathrooms and air conditioning. These can be adapted to double beddded cabins if required. Included within your charter are 3 freshly prepared meals a day, selected snacks between dives, bottled soft drinks, mineral water, tea and coffee. Extras available to purchase on board are local wines, beers, mixers and diet drinks. Flights are available from both Gatwick and Birmingham to Marsa Alam. Depending on the charter departure day it may be more convenient to fly from Gatwick, Manchester or Birmingham to Hurghada. Upon arrival you will be led aboard and receive your boat briefing whilst your evening meal is being prepared. During dinner you have the chance to meet your fellow divers for the week and chat about the reefs you’re likely to visit. The following morning after breakfast Blue Pearl aims to leave port between 8am and 9am, but departure time is in the hands of the coast guard so please allow an hour either way. Once the diving is underway your weeks schedule is roughly as follows: Day 1 – 2 to 3 dives Days 2 to 5 - up to 4 dives (non Marine Parks) Days 2 to 5 - up to 3 dives (Marine Parks) Day 6 – 2 dives For the Blue Planet fleet of liveaboards there are a few restrictions and some recommendations on dive qualification and logged dives. North & Wrecks – 20 logged dives, open water or equivalent (recommended) St Johns – 30 logged dives, advanced open water or equivalent, (recommended) Marine Parks such as Brothers, Daedalus, Zabargad & Rocky require a minimum of 50 logged dives and advanced open water or equivalent.